There are many different analytical techniques used to identify and quantify a wide range of substances in complex matrices such as the atmosphere, factory air, water, plants, soils, foods and industrial and pharmaceutical products. It is therefore of critical importance for researchers in many fields in both industry and academia to be familiar with the most suitable methods for their own applications, and to know how to get the best results when using these methods. Analytical Chemistry of Complex Matrices systematically discusses the key elements of the analytical process, from definition of the problem through sampling and separation, to calculation of the analytical result and ultimately the solution to the problem. Subsequent chapters are arranged by analyte type (such as inorganic, organometallic and organic analytes) rather than by analytical technique, and present selected analytical problems involving a broad range of analytes and matrices. A wide range of techniques is covered, from classical techniques such as gravimetry and titrimetry to state-of-the-art instrumental techniques such as high performance liquid chromatography and inductively coupled plasma mass spectrometry. Worked calculations are included throughout and careful attention is paid to the underlying chemistry of each analytical method. Analytical Chemistry of Complex Matrices will be of great interest to all research students and practising scientists whose work involves qualitative and quantitative analyses of complex matrices. Its highly practical approach, combined with the broad range of analytes, matrices and techniques considered, will make it an invaluable source of information to all such workers in both industry and academia. 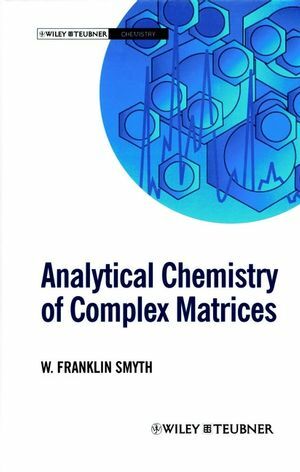 W. Franklin Smyth is the author of Analytical Chemistry of Complex Matrices, published by Wiley. Unit Processes of Analytical Procedures. Selected Analytical Problems Involving Inorganic Analytes Which Contain Elements From Groups IA-VIIIA and the Lanthanides. Selected Analytical Problems Involving Inorganic and Organometallic Analytes Which Contain Elements From Groups IB-VIIB. Selected Analytical Problems Involving Organic Analytes Which are the Major or Minor Constituents of a Sample. Organic Trace Analysis of Low Molecular Weight Analytes in Environmental Samples and Biological Materials. Analysis of High Molecular Weight Analytes.